Thank you for puchasing our highest rated doorbells. If you are not 100% completely satisfied, simply contact us to request a refund or exchange! 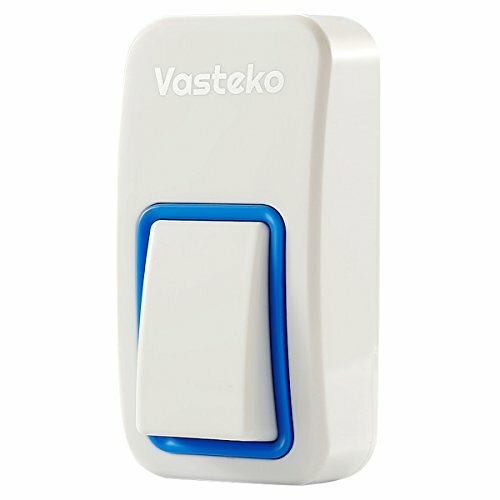 EXTRA ADD-ON TRANSMITTER - The unit is NOT comatible with other brand wireless doorbell expandable system, only for Vasteko Brand. Please notice! IPX7 WATERPROOF TRANSMITTER - The internal components of the transmitter are waterproof coating, you can soak it in the water for long time, it still works well. Receiver is made of ABS plastic, inflaming retarding and environmental protection. EXPANDABLE & DIY -You can DIY to meet your requirement by pairing additional receivers and transmitters. Maximum support for 3 transmitters, the number of receivers is no limit. LONG RANGE UP TO 400FT /120M - Either you are occupied in the garden or kitchen, you will always be easily informed when someone pushs the doorbell button. FCC, RoHS certified. NOTE - This unit does not contain receiver. If you have any questions about this product by Vasteko, contact us by completing and submitting the form below. If you are looking for a specif part number, please include it with your message.